A busy few days for the stable kicks off at Moonee Valley on Friday night with three runners including a leading chance in one of the night’s features – the $200,000 Gr.2 Stutt Stakes. 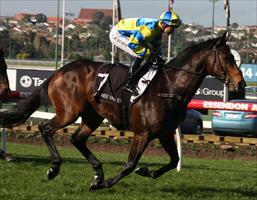 The VRC Derby bound Sabrage (pictured) is our runner in that event, Damien Oliver to take the ride. Having his first start at the mile, the well related son of Charge Forward and the excellent mare Galroof looks nicely placed and has pleased the stable with his progress since a close up fourth in Listed company at Flemington three weeks ago. Back to the opening event in which we are represented by the promising Devonshire Duke who resumes after winning in game fashion at his Doomben debut in July. Aimed towards such races as the Carbine Club Stakes and the Sandown Guineas, the New Zealand bred son of Keeper may need some luck from barrier eight of nine but Luke Nolen is riding in good form. Also being seen for the first time since a Queensland campaign – winning at Listed level in mid-June, Born To Rock kicks off in the second event with Kerrin McEvoy to take the ride.